Owen Hatherley on public expenditure cuts is less ranty – and more reflective – than one might expect. Not so long ago I stumbled into a little pop-up in Hoxton: a delightful tearoom hardly bigger than a walk-in wardrobe, all 1940s home-craft ‘boutique’ style. Nice table linen, a ‘make-do-and-mend’ tea service with artfully mix-matched china, victoria sponge slices, and the strains of some popular bygone tune in the background. I’m not sure I got much change out of a crisp new tenner, but retro heaven, right? Before I’d even got my hands on Owen Hatherley’s The Ministry of Nostalgia (nice austerity-era block-red dust jacket) I had the feeling — call it gut instinct — that this sort of austerity chic might not be quite the author’s thing. I don’t mean aesthetically — though a little of that too, since Hatherley’s thing, as anyone who’s read his books on architecture will tell you, is Soviet-bloc brutalism and the utility end of high-modernism — but ideologically. This short book is all about castigating our current obsession with designer austerity while being fed an endless diet of the gruel of real austerity, along with a gutful of phoney ‘We’re all in this together’. So, that’s where Hatherley’s coming from. He begins with that wretched ‘Keep Calm and Carry On’ poster, exploring at length its sudden ubiquity from 2009 on. 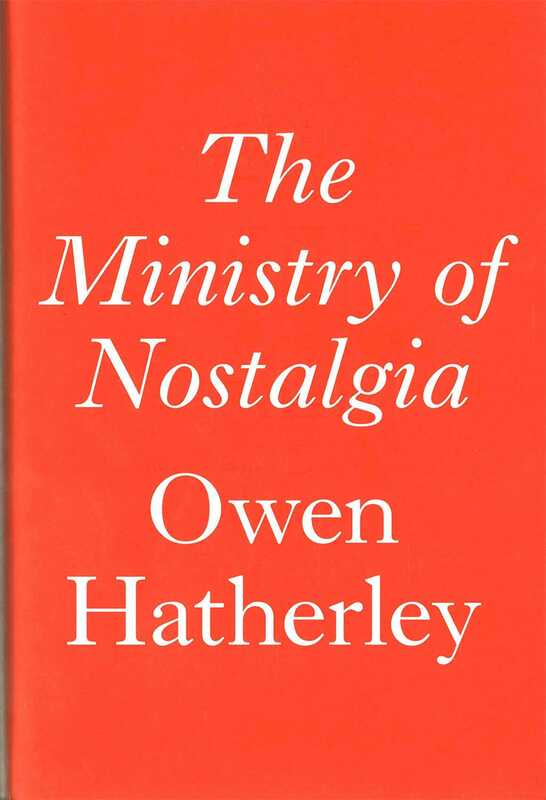 The blurb promises a ‘polemical rampage’, but The Ministry of Nostalgia is not quite that: it’s more thoughtful than blistering, more insightful than ranty, more reflective and intelligent than anyone could be if they were simply wedded to a defensive political position. But sometimes, as when he sets out to deflate the nostalgia associated with the Festival of Britain, he reveals he’s not fully confident with his material. Herbert Read, the curator of the Festival of Britain’s art exhibitions, had his prejudices but he didn’t ignore more adventurous avant-garde artists such as Richard Hamilton simply because he favoured ‘modernism as consensus, not dissonance’. He wasn’t a prig, but an anarchist, and co-founded the ICA. Hamilton showed at the ICA in a satellite exhibition and artists such as Lynn Chadwick were included on the main site — and I’m not sure the now largely forgotten British sculptor can be fairly described as a ‘modern romantic’, or that in any case the term should be so dismissively applied. What’s more, when did working-class and lower-middle-class voters ‘desert Blair in their droves’? Wasn’t this, rather more, a predictable falling off after a decade of a New Labour government that didn’t bring the Third Way utopia it had promised? Somehow Hatherley seems to want to link it all in with austerity (no mention of Iraq here). So why the hung parliament in 2010? And Blair stepped down in June 2007, when the credit crunch was barely a twinkle in an economist’s eye. The book is also prone to stylistic flabbiness: I found myself rereading chunks of it to work out what Hatherley was really getting at. And there are a few passing inaccuracies (the 7/7 bombings didn’t happen in 2004, but 2005). You get the feeling that Hatherley wrote his five occasionally meandering chapters in a hurry; he probably did, since his last book, Landscapes of Communism, only came out last May. But the meat of Hatherley’s argument is pretty much intact. We’re being sold a rose-tinted austerity past — a past that saw the creation of the NHS, improving the lives of working people incalculably — in order to promote a neoliberal Austerity Mark II, in which the poor are demonised. It’s as simple as that. This is a book packed with intelligent insight, but I just wish Hatherley wasn’t a writer in such a hurry. This review first appeared in The Spectator 6 February, 2016.